First of all, after 2 days of worry Pasang checked in and is ok…relatively speaking, since nobody is truly ok at this point. I am relieved to hear from him, but saddened from all of the Sherpa deaths and the impact that will have on the people involved. Almost all groups have decided to cancel the climbing season from the south side (Nepal) out of respect for their fallen friends. There was a lot of drama that unraveled from the Nepali government, but I’m not going to comment. In the end I hope the Sherpa get paid more and get proper life insurance. They are wonderful people and Everest doesn’t get climbed without their much needed support. If their demands are met and other options for transporting supplies above the icefall (helicopters) are implemented then the price for expeditions will likely go up, which could mean less climbers. Not a bad thing. Everest will always remain special, being the highest point on earth and the ultimate mountaineering accomplishment. 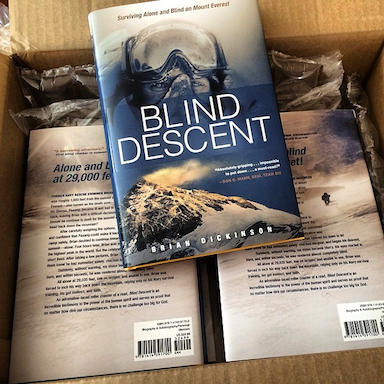 This week a received a few hardcover copies of Blind Descent. I’ve been on with Tyndale marketing to book some TV spots in the next few weeks. I’ll also be at the Summit Classical school auction the first week in May for a book signing, where a % of sales will go to the school. As soon as I know my schedule I’ll be sure to post. Just finished your book 8/10/14 (I picked it up not even realizing it would display God’s glory! Thank you for making that the focus!) I have been studying up on Everest since I have been reading and immediately became nervous for Pasang after I read what happened in April. Thank you for posting that he is ok! I am deeply grieved by that disaster and will continue to pray.